GT667PCIe-1 integrated in a GT9000PC, an out-of-the-box integrated system solution. GT668PCIe-1 integrated in a GT9000PC, an out-of-the-box integrated system solution. The GT9000PC includes a 2 channel GT Blade installed in a high performance PC chassis with windows 10 operating system, 8 GB RAM, 1 TB storage and integrated GT9000 GUI. When turning the system on, it displays the GT9000PC GUI i.e. it is an out of the box solution that you can use immediately by utilizing the GT9000PC GUI. The instrument manual is installed and appears on the left side of the screen together with other usable icons and sample programs for application customization. 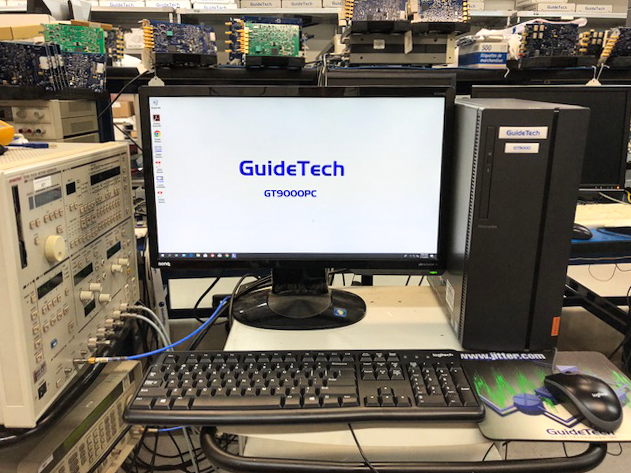 This Low-Cost GT9000PC is a 0.9ps, 2 channel, Zero-Dead-Time TIA-Time stamper/Frequency Counter that is based on the 2.7GHz GT667PCIe-1 or GT668PCIe-1 “CTIA” Continuous Time Interval Analyzer. The GT9000PC system GUI is very friendly and easy to use. We also provide all drivers and support for custom application development in Windows, Linux, LabVIEW Python and Java.